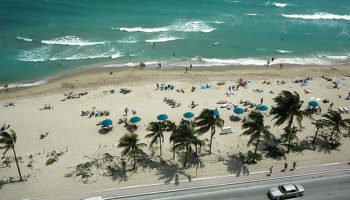 The sun-drenched city of Miami, and neighboring Miami Beach, is a fabulously fun place to visit. 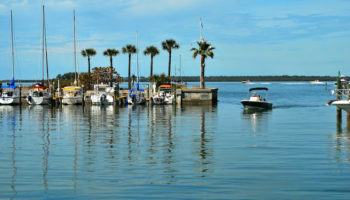 With a lively nightlife, famous sandy beaches and dynamic Latino culture, these southernmost cities of the United States are a popular destination year-round. Miami’s sun-washed pastel color palette is an iconic aesthetic in itself that has influenced fashion and trends. Art Deco architecture and modernist buildings are the backdrops for Miami’s fashionable faces to strut their stuff along beachside boulevards and in streetside eateries. The booming Latino community has more than just shaped the area’s culture: Spanish can often be heard on the streets, on the beaches and in the bars. There’s also an incredible amount of mouthwatering food on offer across the city, infused by the Cuban families that have made Miami home. In neighboring Miami Beach, you can really live the dream. Connected to Miami by bridges, spend your holiday sunning yourself on the vibrant South Beach and gazing at the Art Deco aesthetics. When it comes to where to stay, both cities have a whole lot on offer: you’ll be spoilt for choice with high-end hotels featuring sea views and 5-star service and elegant boutique hotels with opulent interiors, while you can also find budget-friendly stays in the city. Miami has something for everyone. 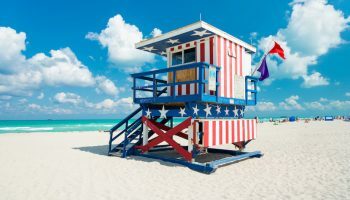 So if you’re looking for a holiday where you really want to experience a city that’s full of life, character and sub-tropical heat, Miami is the place for you. Located right at the tip of Miami Beach, South Beach may be small, but it’s got a whole lot of personality. All about kooky characters, Cuban culture and neon nightlife, Miami Beach is the young and trendy place to go to be seen. Along its streets, iconic Art Deco architecture is painted in a palette of pastel pink, set against a backdrop of blue skies and punctuated by the tropicalia of palm trees. 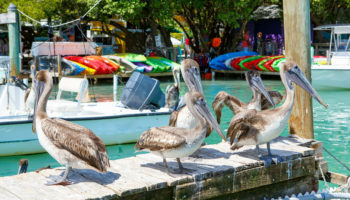 The area has an electric buzz day and night, so if you’re into sipping on a frozen margarita or two and dancing the night away, this is the area for you in Miami. Hotels are lined up along South Beach’s buzzing boulevards, including the iconic seafront Ocean Drive. It’s easy to find yourself chilling out in the pool of a refurbished Art Deco hotel, or luxuriating in the area’s boutique hotels and coastal resorts. The accommodation in South Beach is glamorous with stylish interiors straight from the pages of a magazine. You can simply step outside your hotel and get whisked up in a world of stylish shopping, swanky cafes and delicious seafood restaurants. 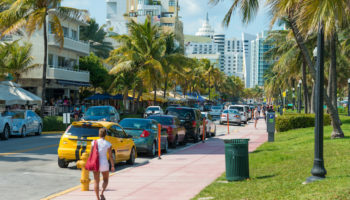 South Beach is only a relatively small area: you can see most of it on foot, or if it’s just too hot for hitting the streets, jump in a cab – or do what the locals do and get on the bus, which should take you to most places around town. 1 Hotel South Beach – Impeccable design and comfort collide in this decidedly upscale hotel. The rooms feature sleek furniture, an eye for minimalism and simplicity, and a cool, neutral color palette. Guests can relax in style at the wellness center and spa, swim in one of four pools, eat in one of the six onsite restaurants, or simply chill in their rooms. In terms of location, Miami Beach Botanical Garden is within walking distance of this hotel. W South Beach – Just a stone’s throw from the beach, W South Beach is a towering luxury hotel that’s cool, stylish and Instagram friendly – an updated version of the playful classiness that Miami has always been known for. The pool is surrounded by slick black and white striped day beds, the rooms are chic, bright and design-led, and boast ocean views. Overlooking the Atlantic Ocean, this branch of W is one for all you design fiends out there. Loews Miami Beach Hotel – This 4-star hotel is positioned directly on the beach, making it a great option for those who place high importance on being close to the sea and sand. 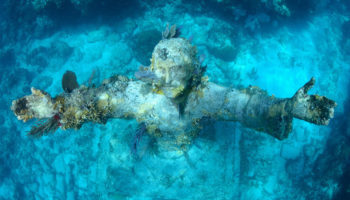 Other nearby things to do include Lummus Park – a three-minute walk away – and all the coolness of Miami’s Art Deco District – a mere five-minute stroll. This hotel is all about luxury; with six dining options, a sprawling pool area, and much more, you won’t ever want to leave. Hotel La Flora – Hotel La Flora is housed in a building that exemplifies the Art Deco style of many of Miami’s early 20th century buildings, instantly making it a cool place to stay for design sensitive travelers. Rooms are classic, simple and stylish, with sleek lines, marble sinks and understated design taking center stage. In terms of location, it’s less than five minutes on foot to the beach. Mid-Beach is the luxury stretch of Miami Beach, once the playground of the infamous Rat Pack, sandwiched between North and South Beach. 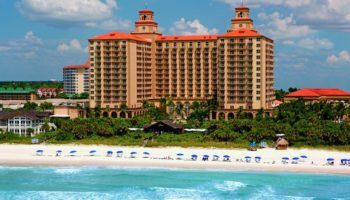 It’s home to many of the city’s most famous and iconic historic hotels, including the Fontainebleau Hotel (which had a $1 billion re-opening in 2008), Eden Rock and the Ocean Spray Hotel. They form part of the Art Deco heritage of Miami Beach, along with the cool Collins Waterfront Architectural District, which has also recently been renovated. It’s positively littered with architectural gems from the 1940s to ‘60s and makes for a very Instagrammable wander. There’s even the Art Deco Welcome Center for those who just can’t get enough. There’s some chic dining to match the chic hotels here, with many stylish bars and restaurants to try out; from Southern food at Bird & Bone to sophisticated Italian at Cecconi’s. All are good options after a day of lazing on the beach. If you’ve got the money, a stay at one of the landmark hotels is a pretty cool option. At the 1950s Fontainebleau, for example, there’s a slew of restaurants, 11 pools, even a nightclub. It’s like a town in its own right. Don’t worry though: there are a number of affordable hotels, too, so you can stay in an Art Deco wonderland without breaking the bank! Fontainebleau Miami Beach – The original iconic Miami hotel, Fontainebleau Miami Beach was constructed in the 1950s and feels like a landmark of the cool, blocky, white-washed style of building that made Miami famous. It is set in a bold, curving arc of a towering building, and with plenty of outdoor pool space for guests to use. Rooms are neutral, luxurious, and beautifully understated, complete with floor to ceiling windows boasting city or sea views. This genuine slice of Miami is just steps away from the beach. The Palms Hotel & Spa – Gorgeously nestled amid beautiful tropical greenery and gardens, and with its own refreshing swimming pool, this hotel is quite literally on the beach. The rooms at this hotel utilize the classic Miami architecture to the full extent, modernized with simple yet upscale furnishings that feel updated but fitting. As well as trendy lobby spaces, there is a tiki bar and cabanas to chill out in, as well as an organic farm-to-table restaurant. L Hotel – Set in a classically ‘Miami’ building, L Hotel is a cool boutique offering that adds eclectic furnishings and color pops into its heritage white-washed interiors. With a light, European-style breakfast available, as well as an onsite snack bar and relaxing courtyard area, this funky 3-star hotel serves as a trendy place to recharge your batteries before hitting the sparkling beach, which is a mere three-minute walk from this hotel. 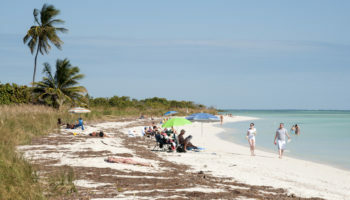 Packed in between 65th and 85th Streets along Miami Beach, North Beach might not be as glitteringly glamorous as South or Mid-Beach, but its lack of tourist crowds and its long ribbon of sandy beach means it shouldn’t be overlooked. North Beach is home to the ultimately stylish post-war Miami Modernist architecture – labelled MiMo architecture – that’s all shapely curves and blocky shapes which ooze Miami cool. If you’re traveling on a budget, Miami’s North Beach might be the spot for you. 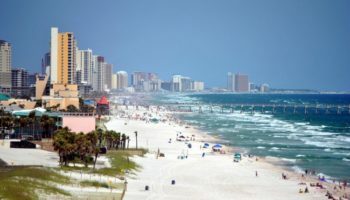 Like a well-kept secret, the accommodation on offer is much more affordable than South Beach, making the area more appropriate for budget travelers. Hotel offerings range from 2-star locally run hotels all the way to 5-star luxury. Without the all-night parties of its neighbor, North Beach is much more laid-back and quiet, but with a fiercely fun and diverse local community, a large proportion of which has lived in the area for years. Sitting in the area’s local cafes and shopping in the malls will give you a glimpse into the real life of Miami, which in years to come will likely be lost to development and big business. Mare Azur Miami Luxury Apartments – Positioned right on the beach, this is the perfect slice of Miami action for anybody wanting to spend a lot of their time soaking up the sun, sea, and sand. These apartments are decidedly luxurious and feature full kitchens that even include ovens. There’s a pool, sauna and hot tub, as well as an onsite fitness center for guests’ use, but this place is all about its style and proximity to the beach. Oceanside Hotel and Suites – Set in a cool, classic building that is Miami style through and through, the rooms at Oceanside Hotel and Suites have been renovated and now offer up a slick sense of modern style. The outdoor pool comes lined with sun loungers and tropical greenery. There’s a restaurant and bar called The Tavern, open 24 hours, located here, with a daily happy hour when drinks are complimentary. The beach itself is just a hop, skip and a jump away from this stylish offering. Home to the biggest concentration of skyscrapers in the region, this is Miami’s central business district, packed to the brim with museums, banks, corporate headquarters, courts, theatres, parks, loads of shops and some of the oldest buildings that Miami has to offer, including some very grand 1920s skyscrapers. In fact, this part of the city is its oldest: development began in the 1890s, and it’s never looked back. When it comes to actually choosing Downtown as a place to base yourself in Miami, you’ll find mostly more expensive mid-range and upscale offerings at the usual suspects like Marriott, Hilton, InterContinental and Hyatt. No matter what you want to do here, it’s made extremely easy thanks to the futuristic Metromover. This small-scale people-mover, incredibly, is free and stops at all the main points around the district. So even if you’ve blown your budget on a hotel, you won’t be stuck there! And when you’ve had enough of being tucked between skyscrapers in the heat, you can head to the Bayfront Park to get some fresh air in this little slice of nature in the city or take a romantic stroll along the Miami Riverwalk. InterContinental Miami – With its outdoor pool and the fact that it’s set in a towering block with Bay views, the InterContinental Miami is the epitome of luxury accommodation in Miami. Onsite guests can enjoy a coffee shop, a Latin American restaurant, and choose to work up a sweat in the fitness center any time of day – since it’s open 24 hours. Rooms boast marble bathrooms and flat-screen TVs. Nearby, the Bayfront Park Station makes it easy to travel around Miami. Hilton Miami Downtown – A towering, modern hotel, the Hilton Miami Downtown features rooms that boast floor to ceiling windows, contemporary, design-friendly furniture, and a sense of classic meets simplicity. With amenities that range from a rooftop pool to a cocktail lounge – as well as an international restaurant – this Miami branch of Hilton is set in a good location when it comes to exploring what the city has to offer; the nearest Metromover stop is just a three-minute walk away. Eurostars Langford – Set in a gorgeous building that dates back to 1925, Eurostars Langford makes for a cool, luxurious stay in the city. The rooms are stylish and feature good design details, like rainfall showers, and soft, comfortable sheets. There’s a restaurant on site, but this hotel is also in a good position to get to grips with Miami. It’s just one block away from the nearest metro station and only a ten-minute walk to the coastal Bayfront Park. Nicknamed the Manhattan of Miami, Brickell bursts with flavorful food and fashionable young professionals going about their daily business. Situated next to Downtown, the densely packed district thrives with big corporations, mighty towers of industry and chic condominiums. Getting around the center of the city from here is easy and free, if you use the Metromover (there’s a stop in Brickell) that laces the skyline on rails, above the cafes and restaurants. Sharp-suited and straight-talking, Brickell is often drenched in brilliant sunshine. The romance of Miami’s Art Deco architecture has been almost erased here and replaced by shiny new hotels and other high-rises that glint in the sunlight. There are some fantastic opportunities for a spot of shopping inside the air-conditioned malls and, after a busy day spending some cash, the best way to unwind is in one of Brickell’s rooftop bars. Choosing to stay here is a good option if you have a more generous budget since most of Brickell’s hotels are pricey. Thankfully, there are a few affordable options. EAST, Miami – With amenities ranging from a super cool Uruguayan restaurant and chic rooftop cocktail bar to a choice of four outdoor pools and a fitness center, EAST is a luxury option with a lot going for it. The rooms, with their stylish furniture and monochrome simplicity, are a design lover’s dream; they feel more like hip, upscale apartments than hotel rooms. Location-wise, there is a tram stop practically on the doorstep of this 5-star hotel, meaning you’ll be able to get around Miami with ease. Kimpton EPIC Hotel – The spacious rooms at Kimpton EPIC Hotel have epic views to match, thanks to the hotel being set in a high-rise building and all the rooms boasting floor to ceiling windows. Guests will truly be able to pamper themselves in style at this upscale option, thanks to the gorgeous onsite spa – all twelve thousand square feet of it. Featuring two restaurants for guests to choose from, you’ll be spoilt for choice with the drinking and dining options at Bayside Marketplace, which is less than a 15-minute walk away. Atton Brickell Miami – Boasting sleek city views and 50-inch flat-screen TVs, the rooms at Atton Brickell Miami are simple, clean and stylish, with muted decor that lets the views from the floor to ceiling windows do the talking. This 4-star hotel features a cool rooftop area with even better city views than the rooms, as well as a beautiful infinity pool. Getting around Miami is easy; this hotel just a six-minute stroll away from a Metromover station. Along with Downtown, Coconut Grove is one of the oldest parts of Miami. It’s the oldest continuously lived-in district of the city, in fact. Because of this, you’ll find many of Miami’s heritage buildings nestled here, like the 1921 Woman’s Club of Coconut Grove, the Art Deco Dinner Key building (1917), and the Villa Vizcaya, a Mediterranean style treasure built in 1916. But it’s not all architecture. Locally known simply as ‘The Grove’, this is Miami’s largest neighborhood; located south of Brickell, it’s also one of the greenest areas of Miami, filled with parks blanketed with subtropical trees and plants. Most famous of all is The Kampong, a 9-acre botanical garden, but you have to book in advance to stroll in awe around this exclusive little Eden. Overall, staying here is a world away from the bustle of Downtown, and you have to pay for the privilege. Luxury studios, chic apartments and beach clubs form an upper mid-range selection, before the big jump to properly expensive hotels like the Ritz-Carlton and self-catering rooms in beautiful historic buildings. Hotel Aria BW Premier Collection – Modern rooms with cool tiled floors, swish furnishings, and a definite sense of style await guests within this towering block. As well as a pool, sauna, and hot tub, this hotel also has its own restaurant featuring panoramic views. That said, there are more than a dozen restaurants within a five-minute walk of this hotel, making it a perfect option for those who like to get out and explore what a destination truly has to offer. Hampton Inn Miami-Coconut Grove – The rooms at this 3-star offering are simple affairs but boast a sense of modern design that still makes them comfortable places to return after a day exploring the city. There’s an onsite pool for guests to enjoy, as well as a hot tub and fitness center. For those interested in more bang for their buck, there are complimentary drinks and snacks available all day in the lobby. In terms of location, this hotel is just a five-minute stroll from the nearest Metrorail station. This funky area of Miami historically formed the southeast corner of the larger Buena Vista neighborhood, but today has grown into a distinct microcosm of its own. Previously made up of many low-rise warehouses, it fell victim to urban decay before being transformed into Miami’s zone of hip. Its buildings have been repurposed for fashion designers, creative companies, boutiques, cafes, art galleries, restaurants and antique dealers. Being the center for all things cool and fashionable in Miami, the aptly named Design District is definitely the place to stay if cool and fashionable is what you’re into. Renowned designers who’ve made a space for themselves here include big-hitters like Hermès, Yohji Yamamoto, Louboutin and Louis Vuitton, amongst many others. It’s practically jostling with creativity. Unfortunately, the Design District is currently lacking in accommodation. There are hotels to stay in, of course, including the 5-star Mare Azur and the 3-star Hampton Inn and Suites (a Hilton hotel) and the budget-friendly Midtown Inn Miami. You could always base yourself in nearby Downtown and make the trek up here though. Since it’s an up-and-coming neighborhood, however, with a lot of development only taking place within the last 5 years, there’s bound to be an upsurge in accommodation choices in the future. Mare Azur Design District Luxury Apartments – White linen, white-washed walls, sleek furniture, a strong sense of simplicity: Mare Azur Design District Luxury Apartments is definitely an option for those looking for a cool, design-led place to stay. The apartments here, aside from being uber-stylish, come equipped with kitchens, a living room, and some even have their own terraces. Guests can chill out in the pool area, characterized by more sumptuous design and some sublime sea views. Hampton Inn & Suites Miami Midtown – This modern hotel, with its light rooms and contemporary fixtures, is within easy walking distance of all the shopping you could ever want at Midtown Miami. It’s located along Highway 1, making this 3-star offering convenient for those who are embarking on a road trip. There’s an outdoor pool, a fitness center, and even a hot breakfast served every day free of charge. 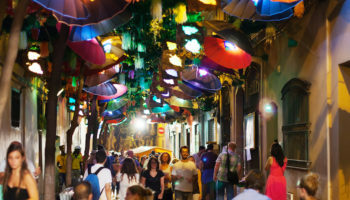 It’s also dotted with artwork by local artists, reflecting the creativity of the area. Far from the lavish fashions and showy opulence of other neighbourhoods in Miami, Little Havana is a slice of Latino life just west of Downtown Miami. The area has been home to a burgeoning Cuban community since the 1950s when many immigrants escaped to America, fleeing Castro to pursue the American dream. The energy and spirit of the Cuban culture ooze from every photogenic inch of Little Havana, from the corners where the older generations hang out together playing dominos, to the cafes splashed in colorful artwork. Little Havana is best seen strolling around at a slow pace, and staying here would mean letting yourself slip into the laid-back way of life. Here you can stay in many affordable lodgings, including the Tower Hotel, a no-frills hotel that’s been going for over 100 years, or in trendy boutique offerings that sit around the corner from some of the tastiest restaurants the district. Life House Little Havana – This extremely stylish place to stay boasts dorms and private rooms, all of which are exemplified by their attention to detail. Soft design features like wood beds and floors sit alongside a sense of classic but modernized decor for a very cool place to stay. Guests can order vegan breakfasts to their room, watch what they like thanks to the super-fast internet, and enjoy the location of this place – just a 15-minute stroll away from the center of Downtown Little Havana.